Kim Fundingsland/MDN A City of Minot truck dumps a load of snow at Sertoma Sports Complex parking lot on North Hill. The snow will be pushed into higher piles to make additional room if necessary. Where will it all go? Where do we put it? Those are questions being answered by Minot’s Public Works Department following yet another sizable snowfall in the city. The most recent dump of snow in Minot ranged from 5-7 inches. While that’s not considered a big snowfall, it fell on top of record amounts of snow already in the city. Dump trucks were making steady appearances at the Sertoma Sports Complex on North Hill Tuesday. The dirt parking lot there is being used as a dump site for snow being removed from places throughout the city. Jonasson said the Superfund site south of MAYSA may also be used if it should become necessary. He added that additional room for snow at the Sertoma Sports Complex can be achieved by using a bulldozer to push the growing piles of snow higher that what they currently are. How much snow needs to be hauled has not been calculated said Jonasson, noting that the process will continue as long as necessary. It is an immense undertaking, even when working around the clock. “When we get things opened up again, the night shift will work on hauling. We’ll probably hire contractors to help us again,” said Jonasson. The cost of hiring private contractors has cut into the city’s emergency fund of $750,000. According to Jonasson the city spent $37,500 per day for four consecutive days on private contractors to assist with snow removal following the Christmas blizzard. The city owns two road graders and leases six more during the winter months for snow removal. In addition, Minot owns three payloaders, one which is equipped with a large snow blower, one that is used for clearing snow from cul de sacs and other areas that cannot be cleared by a grader, and one used for loading sand and salt into city trucks. One of the areas where snow must be removed is downtown Minot. The city has contracted with Strata to accomplish that task. “They are hauling nights down there. It’s been going slow because there is a lot of snow but they have been making pretty good progress,” said Jonasson. Jonasson estimated late Tuesday that it would take about 48 hours to clear snow from the city’s emergency routes and choke points, such as underpasses and bridges. In some areas, snow will be pushed back as far as practicable before hauling will begin. However, noted Jonasson, not all areas will have snow hauled away. 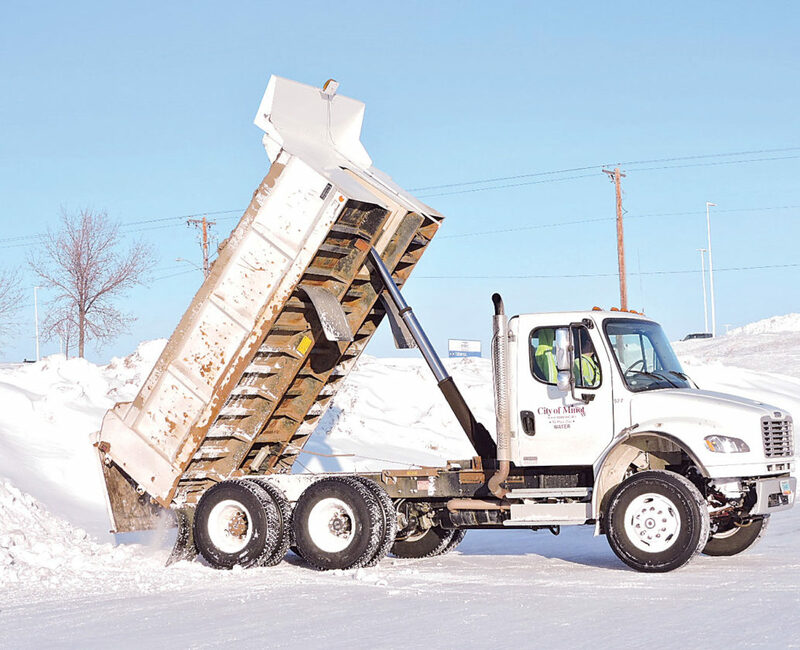 “We’ll be looking to haul snow from some major thoroughfares and intersections with poor visibility, but it’s virtually impossible to haul all the snow from residential areas,” explained Jonasson. Citizens of Minot are asked to avoid parking on city streets if possible to avoid hindering snow removal efforts. The city remains under a Snow Removal Emergency that was declared November 30, 2016. A Snow Removal Emergency prohibits vehicles from being parked along emergency snow routes.